later: pathological Q-wave in the precordial leads V2 to V4-V5. Anterolateral infarct caused by occlusion of the LAD. The Left Anterior Descending (LAD) coronary artery is the most important coronary artery. 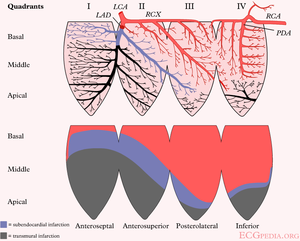 On this mercatorprojection of the heart, the grey area is supplied by blood by the LAD and is at risk if this artery occludes. 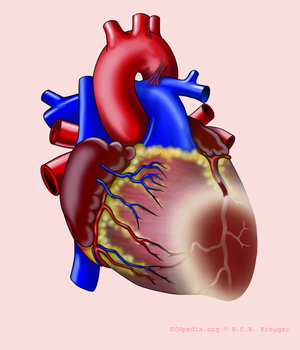 Anterior MI can involve the anterior part of the heart and a part of the ventricular septum. Is supplied by blood by the LAD. Can lead to a cardiac aneurysm if not treated timely. Another way to look at this is by assessing the axis of the ST vector. If it points upwards (with ST depression in II, III, and AVF) the proximal LAD is occluded. If it points downwards (with little ST depression or even elevation in II, III, and AVF) the distal LAD is occluded. An ECG that does not show any ST depression sugggests an occlusion after the origin of the first diagonal branch. A more precise determination of the location of the occlusion can be made with below table. A typical example of an acute anterior wall infarction. A 2 weeks old anterior infarction with Q waves in V2-V4 and persisting ST elevation, a sign of formation of a cardiac aneurysm. A 2 days old anterior infarction with Q waves in V1-V4 with persisting ST elevation, a sign of formation of a cardiac aneurysm. This page was last edited on 8 October 2014, at 10:00.